It was the Supermoon on the horizon that had me rushing all over. This year’s “Supermoon” was actually one of the largest. 14% larger than the Moon when full at apogee. The so-called Supermoon is technically a full moon when it is at perigee. Or the point closest to Earth in its orbit. On top of that, the Moon was full less than 30 minutes before it reached perigee. 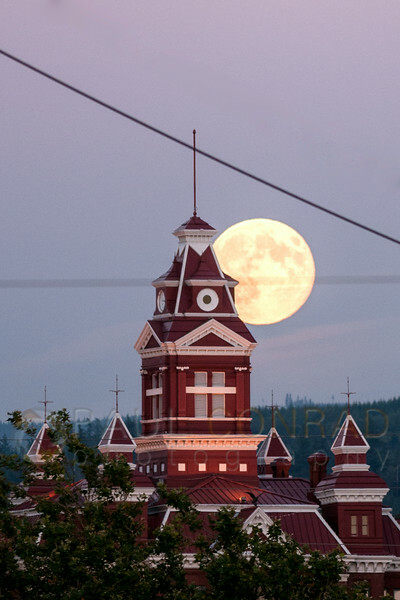 © Paul Conrad/Pablo Conrad Photography – The super perigee Moon rises over the Whatcom Museum in Bellingham, Wash., on Sunday evening August 10, 2014. If it weren’t for the power lines, this would’ve been the shot. I think they’re incredibly distracting. Using both The Photographer’s ephemeris and Sun Surveyor by Adam Ratana. I use both apps on my smart phone. The ephemeris is used to help me find a spot during the day time to line up a foreground subject. Then I use Sun Surveyor to find the near exact spot I should be. The big advantage SS has over TPE is that it shows the real path of the Sun or Moon as it transits the sky. TPE is a good general tool and not much else. © Paul Conrad/Pablo Conrad Photography – Although very similar to a photo I shot last year of a supermoon, I like this better because there are no distracting power lines. My subject was the Whatcom Museum in Bellingham, Wash. It was built-in 1892 and is a beautiful red brick building with white trim. It was formerly the Whatcom County Courthouse, but a new courthouse was built and so the old one became a museum and local landmark. One problem: getting a clear view of the museum and moon. Because of all the power lines, it’s difficult to get a good shot of the museum and moon in a line-free photo. 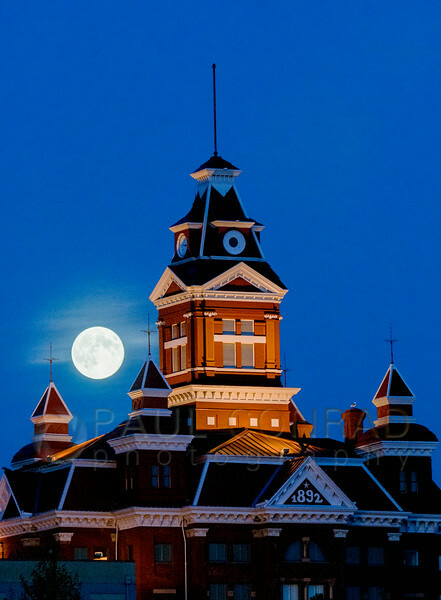 So as I set out looking, I came across a great view of the courthouse and I could see a touch of the moon. ONLY problem was all the power lines in the way. I was on a hill just east of Squalicum Harbor watching the Moon rise over the distant ridge line just behind the museum. I stay and shot some frames anyway for posterity. I like it at it shows the size of the moon, but the power lines are annoying. © Paul Conrad/Pablo Conrad Photography – I like the glow from the Moon on the haze behind the museum. Adds a sense of mystery. I then drove to the one spot I planned to shoot from. Clear shot of the museum and the moon. But it’s also very similar to another Supermoon shot from last year. But the big difference in this is that the moon rise was just before sunset. So the exposure was more workable. Plus, I imported into Lightroom which made the post-processing of the image even easier. I was able to get the Moon to look more natural against the tower of the museum. Not like they’re actually rare events, I’m hoping on the next one to find a better spot. Perhaps the Twin Sisters would be a great shot with the Moon rising over them? 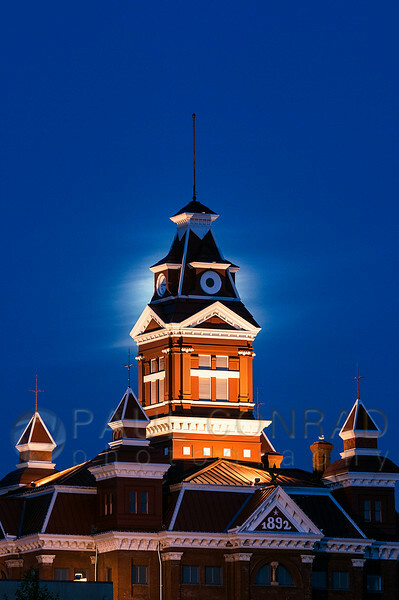 Prints of this image and many others available for purchase on my website Supermoon Over Museum. View more of my images from the Bellingham area at Urban Scenes: Bellingham, Wash. Which photo is your favorite? And why? Let me know in the comments below. UGH – powerlines!! The bane of a photographer’s existence. Great shot anyway and a good example of using Photographer’s Ephemeris. I use that tool to plan time-of-day for architectural shoots. Haven’t heard of Sun Surveyor, but will check it out. Do you have any screen shots of your set-up from PE and SS? Many of us would like to see your methodology. Thank you for commenting. I don’t have screenshots. I ususally dont, but I will from now on. 1. I use the ephemeris to plot a line. 2. Use Surveyor at a few spots to find a good composition. 3. Keep in mind to be fluid and move about to adjust for GPS variations.